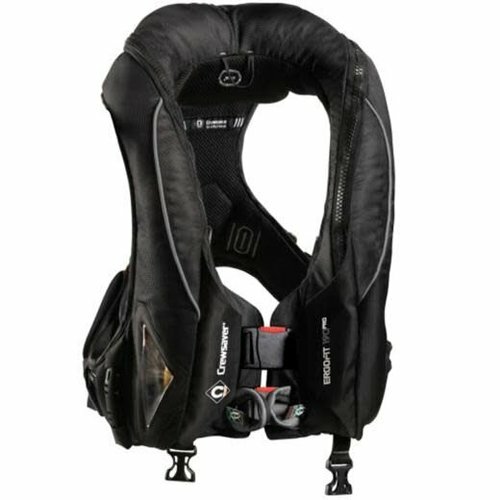 A heavy duty life jacket that has an ergonomic Fusion 3D shape that provides freedom of movement and 500D panels that provide excellent durability. Read more..
Crewsaver's 180 Pro HD Life Jacket has an ergonomic Fusion 3D shape that provide freedom of moment and maximum comfort even during long periods of use. High fit profile and twin waist adjusters enable you to easily put the life jacket on and off. The life jacket features a high visibility, high volume shaped bladder design with peninsula chin support and 180 newtons of buoyancy. There is also an attachment point and lifting becket. 180 Pro features heavy duty 500D panels that provide excellent durability, whilst fabric shoulder panels help to retain a comfortable fit. The compact and lightweight life jacket has a soft loop harness point and a crotch strap fitted as standard. An external indicator window is also included, this enables you to easily check the firing mechanism when required. Compact high fit profile that provides comfort. Heavy duty 500d front body panels that provide maximum durability. Part of Crewsaver's professional lifejacket range, Ergofit, ..
A life jacket specifically designed for offshore use.